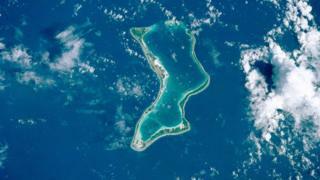 The UK should end its control of the Chagos Islands in the Indian Ocean “as rapidly as possible”, the UN’s highest court has said. The court’s advisory opinion, delivered in The Hague, is not legally binding. The UK’s Foreign Office is yet to respond to the opinion. It is half a century since the UK took control of the Chagos Islands from its then colony, Mauritius. A “blockbuster” of an opinion from the UN’s highest court. The judges assessment was damning. At the heart of it, the right of all people to self-determination as a basic human right, which the UK violated when dismembering its former colony. The detachment of the strategically valuable archipelago cannot have been said to be based on free and genuine expression of the will of the people concerned, when one side is under the authority of the other. As the ruling power, the responsibility lay with the UK to respect national unity and territory integrity of Mauritius as required under international law. Instead, it divided the territory – effectively using the process of decolonisation to create a new colony. As part of the advisory opinion the judges poignantly pointed out that all UN member states were under obligation to cooperate to complete the decolonisation of Mauritius. This includes, of course, the US, which operates a military base on the largest atoll of Diego Garcia.